Welcome to another Friday Bloggers Challenge! This weeks challenge was to use the colors Tangerine Tango, Riding Hood Red, Pacific Pointe and Kiwi Kiss in your creation. My mojo wasn't flowing last nite - I think 24 hours of rain had gotten the best of me! After creating this first card - the more I looked at the colors, the more I thought they'd make a great Christmas card, so I created a 2nd one. For this card - I inked up my rubber brayer and randomly applied the inks to the Gratuitous Graffiti background stamp, then stamped on the white card stock. On this card I stamped the images in black, then water colored them with the colors used in the BC. If you'd like to play along with this weeks challenge, simply leave a link to your creation here, or if uploading to SCS, use keyword BC63. For inspiration using this weeks colors check out the talented Bloggers Challenge Players! Your "mojo" looks pretty good to me! Great idea to brayer the different colors on the BG. And, of course, love the happy snowmen! Hey, I like them both, but I really like the first card best. Great job! Both cards are great with the colors for the challenge...I especially like the Snowman one. The colors are wonderful it Christmas! I am a snowman freak so I really like the holiday card. Great job on both!! Awesome Lisa. Both cards really show off these colors wonderfully. WOW! You did a great job with these colors! The snowman card is so bright and cheerful - great! I love all of the words in different colors too. Well done! TFS! This is TOO cute Lisa! I missed one of the colors! I dont know how that happened! I love the one with the snowman! Too cute! Thanks for letting me play along! You did a fine job with this unique color combo. I think the snowman card is just adorable and your first card has a nice bold feel to it. Okay Lisa this was quite a challenge..but loved it. Your first card, is very intense with color. You are brave to apply ink that way. LOVE both cards! The first one just screams fun, fun and more fun! 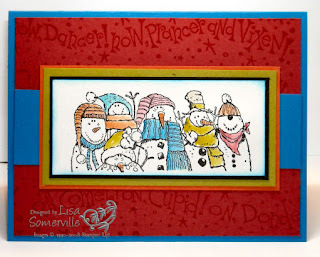 I love the little snowman card, too, especially how you snuck the colors in with those layers! Awesome! Excellent cards, Lisa! I LOVE the snowman one -- totally fun for the holidays! Thanks for the fun challenge! Great cards, Lisa! 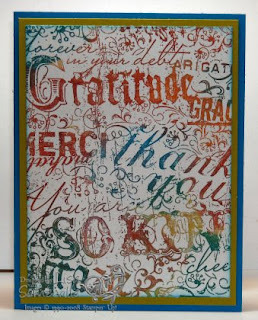 The combined colors look fantastic on the large background stamp--great way to use them all. And how creative to use them for a holiday card, too. Wowzers! you rocked this color combo! these are majestic! you did a great job on this challenge - twice!!! i love both cards! i think your mojo was in a great place when you did the first card...and the second is adorable! Oh my goodness, these colors are perfect for that snowman image. Great job on both cards. Both cards are super fun! Way to let those creatve juices just flow with the Grafetti card!! Great job on both!